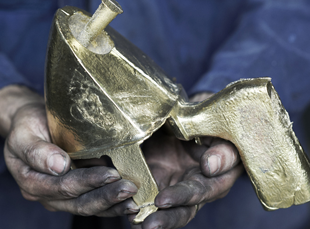 Each piece of Perrin & Rowe brassware is individually assembled by hand; each product is then water tested one at a time to ensure it reached the standards expected. All products include bearing rings and specially engineered ‘O’ rings on both the handles and spouts to ensure a high quality fit, no leaks and the maximum durability. By adding this feature it truly prolongs the service life of the product and allows the Perrin & Rowe products to maintain a quality assurance unreachable by most. It also allows the products to maintain stability and keep a solid and “wobble-free” feel. 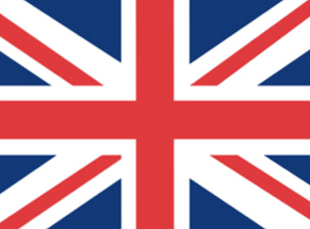 All Perrin & Rowe taps are manufactured in the UK and are then distributed to over 20 different countries. 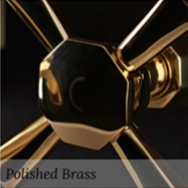 For the reassurance of our customers every single piece of Perrin & Rowe brassware is crafted from the finest approved materials to precise standards. They are hand-assembled within an officially credited ISO 9001:2000 quality assured environment. The ISO 9001 approval rating is recognised all around the world for its stringent and detailed standards and its attention to processes; it is a true mark of international quality. 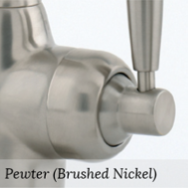 Perrin & Rowe taps are made with ceramic disc valves supplied by the world’s leading ceramic cartridge manufacturer. These valves are tested repeatedly in the factory up to 500,000 life cycles (continuous testing of being turned on and off with highly pressurised water). If calculated that turns out to be roughly 25 years of use in a domestic environment. 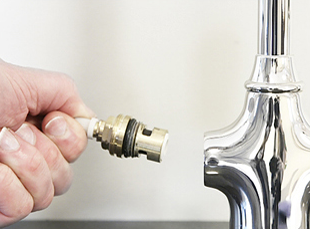 Each and every tap is specifically manufactured for each market meaning that you won’t require any additional adapters or converters for the installation. 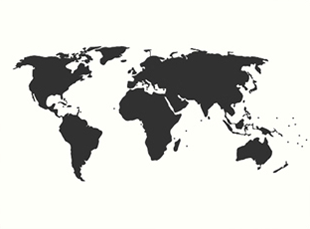 By purchasing your product directly via your own country’s distributor you are ensuring you receive your product certified by the standards of your country and ready for installation right out of the packaging. Perrin & Rowe strongly believe in upholding the international standard requirements for wherever their products are being sold. International approvals include the Australian Standard, the Water Quality Mark, the WRAS and the UPC. 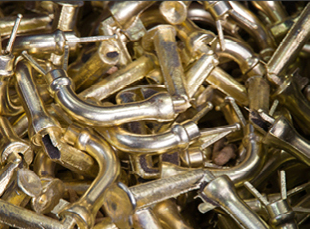 Perrin & Rowe go to the extra effort to source the highest possible quality raw materials for all of their taps; they are either machined in or cast from brass. 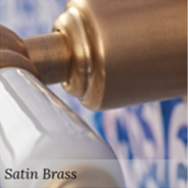 Brass is the ideal material for plumbing works due to its durability (likely to keep its shape and require less maintenance for more years) and it’s high heat threshold; making it highly efficient when it comes to transferring hot water from the boiler to your tap. 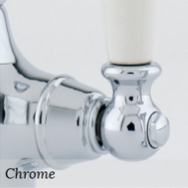 The Perrin & Rowe Contemporary Kitchen Tap collection is available in this range of finishes: Chrome, Nickel and Pewter. 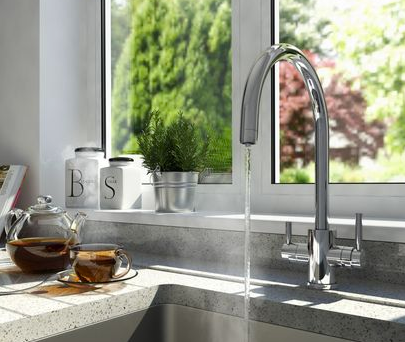 You can also choose between the style of tap ranging between monobloc, bridge-style, three hole and four hole taps and the additional options of a side spray rinser or extra filtration technology. Additional information about finishes is available below. 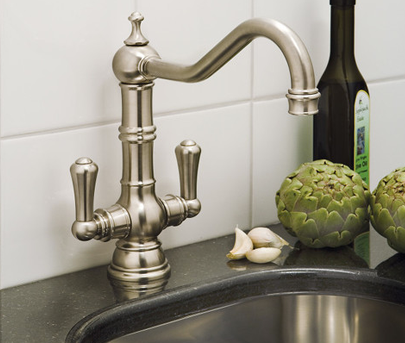 The Perrin & Rowe Country Kitchen Tap collection is available in this range of finishes: Chrome, Nickel, Pewter and Gold. You can also choose between the style of tap ranging between monobloc, bridge-style, three hole and four hole taps and the additional options of a side spray rinser or extra filtration technology. Additional information about finishes is available below. The Perrin & Rowe Traditional Kitchen Tap collection is available in this range of finishes: Chrome, Nickel, Pewter and Gold. You can also choose between the style of tap ranging between monobloc, bridge-style, three hole and four hole taps and the additional options of a side spray rinser or extra filtration technology. Additional information about finishes is available below. 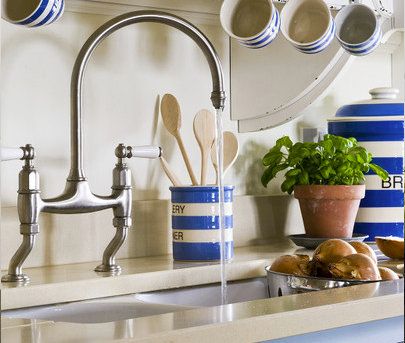 The Perrin & Rowe Instant Hot Water Tap collection encompasses the styles of all the other collections (Contemporary, Country and Traditional); each tap is available in the finishes stated above. Included with every Instant Hot Water tap are the digital temperature display, a compact digital tank for temperature readings and an anti-scalding mechanism. The Perrin & Rowe Filtration Kitchen Tap Collection is available in this range of finishes: Chrome, Nickel, Pewter and Gold. 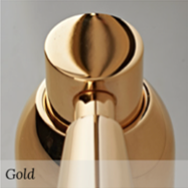 This is the extra filtration technology placed into the previously stated collections of taps; as such the gold finish is not available for the Contemporary collection. 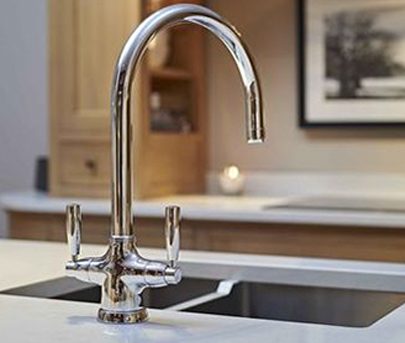 The Perrin & Rowe Pot Filler Kitchen Tap Collection is available in this range of finishes: Chrome, Nickel, Pewter and Gold. 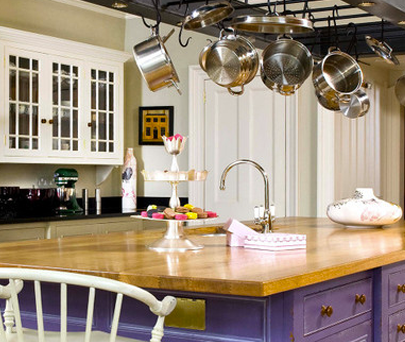 Additional choices include the choice between a modern style lever tap or a timeless classic style crosshead handle. 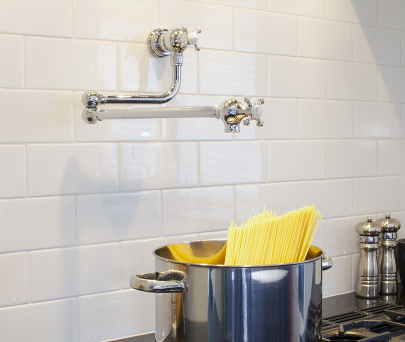 All Perrin & Rowe Brassware can be customised to fit your own personal style and taste with a range of eight high quality finishes designed to perfectly compliment a wide range of kitchen designs, appliances, cabinetry and fittings. A number of these finishes are described as 'living' which means they develop a unique colouring over time as they react with their environments. Chrome is a brilliant silver finish, with a splash of light blue mixed in. 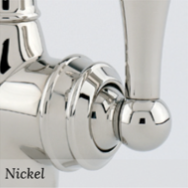 Nickel is a reflective silver finish with a slight golden glow. Pewter is a brushed nickel finish with a blueish grey matte appearance that compliments other brushed finish sinks and appliances perfectly. Polished Brass gives off the air of a quality appearance, plus the coppery undertones make it radiate with a warm glow (Living Finish). 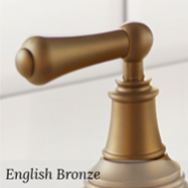 English Bronze is a rich metallic bronze finish with subtle orange and copper undertones; its classical appearance is usually defined as antique. 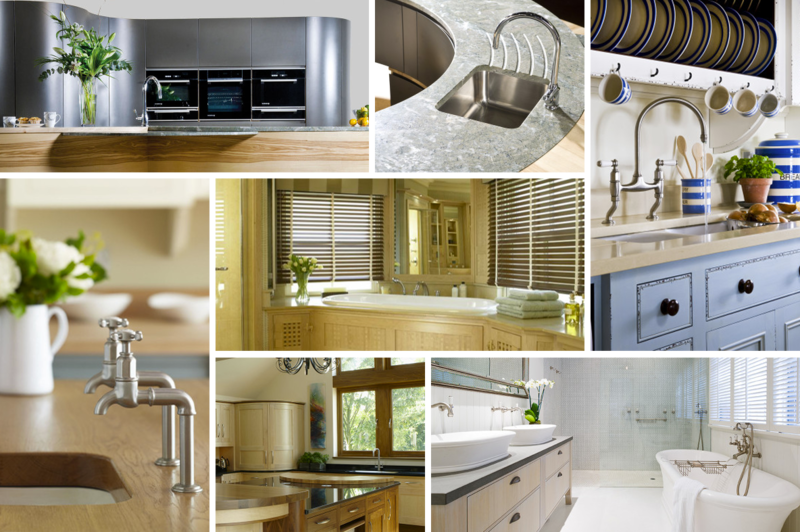 It is our duty, here at Sinks, to stock and sell the highest quality sinks, kitchen taps, brassware, accessories and plumbing. Every single one of our products are approved and tested thoroughly to ensure your peace of mind and the comfort in knowing you’re receiving the highest quality product imaginable. 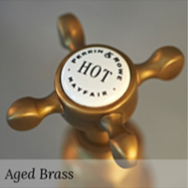 We are a leading supplier of all Perrin & Rowe’s brassware; we ship their high quality products at the most affordable prices and with a level of care we guarantee can only be matched by the manufacturers themselves. We are proud to be a cog in the Perrin & Rowe wheel and we vow to maintain the same quality, care and attention to detail from the factory, to our warehouses, to you.